How does diabetes affect buying life insurance? While many think life insurance costs more if you have diabetes and finding coverage may be more difficult, there are life insurance companies who will offer coverage. We understand the importance of protecting your family from a financial struggle in the event of premature death and will work with you to get affordable life insurance coverage. Life insurance carriers all follow a different set of underwriting guidelines. This means that each carrier will rate a certain condition differently and life insurance costs will vary from one company to the next. While one company may decide to give an applicant a Preferred Plus rating for a certain condition, another company may offer only Standard. This is where we can help you. We have relationships with many of the best life insurance carriers and know the idiosyncrasies of each. Once we know your unique situation, we will shop your case at the appropriate carriers to help you get the best possible coverage. Having diabetes will affect your life insurance pricing, but it doesn’t have to mean that you can’t get approved for a policy. Not all life insurance companies evaluate health conditions in the same way. For example, the way companies view A1C levels can vary. Whether you have Type 1 or Type 2 diabetes or a history of gestational diabetes, Quotacy can shop the market and help you get life insurance. Diabetes Mellitus (DM) is a health condition characterized by hyperglycemia (high blood sugar) in which there is an inadequate amount of insulin for the needs of the body (Type 1) or the insulin that is produced is ineffective (Type 2). The Centers for Disease Control estimates that in the U.S. diabetes affects 18.2 million people (or 6.3 percent of the population). Of this group, nearly one-third are undiagnosed. Insurance medical testing discovers some of them. Type 1 diabetes, formerly called juvenile-onset or insulin dependent (IDDM), has a peak age at onset of 12 years old. It is unusual to begin after age 40. Type 1 diabetes occurs due to beta cell destruction resulting in an insulin deficiency which must be replaced by insulin injections. Symptoms include excessive thirst, excessive urination, and weight loss. Type 2 diabetes was formerly called adult-onset or noninsulin dependent (NIDDM). It occurs when the body does not produce enough insulin or resists insulin. Type 2 usually develops over the age of 30, but its incidence is increasing in children and adolescents, especially those who are obese. It’s usually not diagnosed until health complications have occurred. Many have excessive thirst or urination, but most have no symptoms. Type 2 is initially treated with diet and exercise. If decreased calorie intake and increased exercise does not result in blood glucose control, oral medication is added. Type 2 may also require insulin in the later stages. Risk factors for the development of type 2 diabetes include older age, obesity, positive family history, and history of gestational diabetes. Gestational diabetes is different from Type 1 and Type 2 because it is a short-term condition that can sometimes happen during pregnancy. The main reason life insurance underwriters take caution with gestational diabetes is because it can increase a woman’s likelihood of developing Type 2 diabetes later on in life. Most insurance companies will not approve life insurance coverage for a woman currently pregnant and diagnosed with gestational diabetes. Carriers also won’t offer coverage if you are currently pregnant with a history of gestational diabetes. 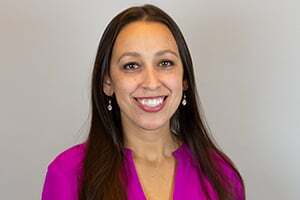 If you’re pregnant with a history of gestational diabetes, most companies will want to postpone offering coverage until six weeks post-delivery. The risk class they then assign to you (this determines how much coverage will cost) will vary among life insurance companies. If you were pregnant and had gestational diabetes, apply for life insurance through Quotacy to make sure you get the best price possible. Quotacy is a life insurance broker. Brokers are able to work with multiple insurance companies and can shop your application around to be sure you’re getting the best policy for your needs and budget. It’s impossible to plan out every scenario in life, but consider purchasing life insurance ahead of your pregnancy. Planning beforehand will give you the most favorable pricing and plan options. Just check out the quoting tool for an estimate on a term life insurance policy. You do not even have to give out your personal contact information. Diabetes ratings increase with younger ages, longer times since onset, poor control, and complications. These would merit debits added onto the basic rating. Meanwhile, credits would be added if the condition is well-managed. After the underwriters review the complete application and all the records that go along with it, they then decide how much coverage and at what life insurance cost to offer the applicant, unless they decide to deny or postpone the application. Most applicants who live with diabetes will end up being “table rated.” The table rating system typically means that your pricing for life insurance will be the Standard price plus 25 percent for every step down the table you are, Tables A-J or 1-10 depending on which format the insurance company uses. Example: As you can see from the chart below, if one company rates you as a Table 5 and another company rates you as a Table E, you would be equal in the eyes of the two insurance companies. One just chooses to use numbers and the other uses letters. Let’s take a look at some real-life examples (names have been changed). Jane Doe is 30 years old, a non-smoker, and was diagnosed with Type 1 diabetes when she was 4 years old. She visits her doctor every 6 months and her diabetes is controlled by insulin – 70 units per day. She monitors her own blood sugar and the most recent reading was 112. Her most recent HbA1c level (glycated hemoglobin) was 7.4. She has not experienced any chest pain or coronary artery disease, protein in urine, neuropathy, retinopathy, abnormal ECG, overweight, elevated lipids, kidney disease, black out spells, or hypertension. She does not have any other major health problems. She applies for a $250,000 20-year policy and tells her agent she would prefer a term policy, but will consider a permanent policy. Insurance Company A offers Jane Table H non-tobacco. This means that if the Standard premium cost is $24/month, Jane would instead have to pay $72/month (24 + 200%). Insurance Company B offers Jane Table 10 non-tobacco. This means that Jane would be paying $84/month (24 + 250%). Insurance Company C offers Jane Table 8 non-tobacco, but only for a permanent policy. They opt to decline offering a term policy. A permanent policy averages to be about 10 times more expensive than a comparable term policy, so here Jane would be paying $720/month. Insurance Company D decides to decline Jane’s application altogether. They would prefer to not accept the risks. John Doe is a 54 year old male, a non-smoker, and was diagnosed with Type 2 diabetes when he was 49. He visits his doctor every 6 months and his diabetes is controlled by daily medication. He monitors his own blood sugar and the most recent reading was 116. His most recent HbA1c level was 6.2. Other issues are elevated lipids, but controlled by medication, and history of kidney stones. He applies for a $500,000 20-year term policy. Insurance Company A offers John Standard to Standard Plus (depending on full review of his medical records.) Taking John’s age into consideration, we can estimate his Standard to Standard Plus premiums to be in the range of $135 – $150 monthly. Insurance Company B offers John a possible standard non-tobacco rating, as long as there have been no kidney stone attacks within the past year and no other complications. Insurance Company C offers John Table 2. With $150 being his estimated Standard monthly cost, we calculate 150 + 50% to equal an estimated $225 monthly premium payment. Insurance Company D offers John Table C. To calculate a monthly premium estimate we take 150 + 75% to equal approximately $263. *We say “Tentative Offer” because during these underwriting studies, the life insurance carriers come back to us with an idea of what they can offer our client. The company takes an overview look at the client to give a tentative offer. They still need to do a full review of the application and all records before confirming any premium costs and rating classifications. If there is evidence that your condition is well-managed, your chances for coverage are much higher. If you have other health conditions in addition to diabetes, coverage will be more challenging to obtain, but, again, the more information we have the better. We have relationships with many insurance carriers and will work hard to find you coverage. Along with the information from your application and questionnaire forms, the medical exam results and possible medical records help the life insurance underwriters determine how much life insurance coverage they can offer you and at what price. Premiums may be higher than that of non-diabetics because the insurance companies consider insuring people with diabetes a higher risk. If there is evidence that your condition is well-managed, your chances for coverage are much higher. If you already bought a life insurance policy and were diagnosed with diabetes afterwards, then you do not have to worry. Changes in your health will not affect your policy as long as it is already inforce, or “active”. This is one of the many reasons why it is wise to buy life insurance sooner rather than later. The situation changes, however, if you bought a non-portable policy through your group plan with your employer. Should you leave that company, your policy would end and you would need to apply elsewhere. Your diabetes diagnosis would then be taken into consideration. Because most employer-sponsored life insurance policies are only valid as long as you are employed there, it is a good idea to look into purchasing an individual life insurance policy outside of your group plan. A benefit to working with Quotacy is that we work with multiple A-rated life insurance companies. As you can see from the above examples, shopping your application around to more than one insurance company can only help you. Quotacy has years of experience getting clients life insurance coverage, including diabetics. Our in-house underwriter has worked in many carrier home offices, knows how to navigate each individual’s health history, and knows which life insurance company would be the best option for your individual case. If you are ready to buy life insurance coverage, get a term life insurance quote now and let’s start the process. If you have any questions regarding underwriting diabetes, feel free to contact us or jot us a message in the Comment section below. 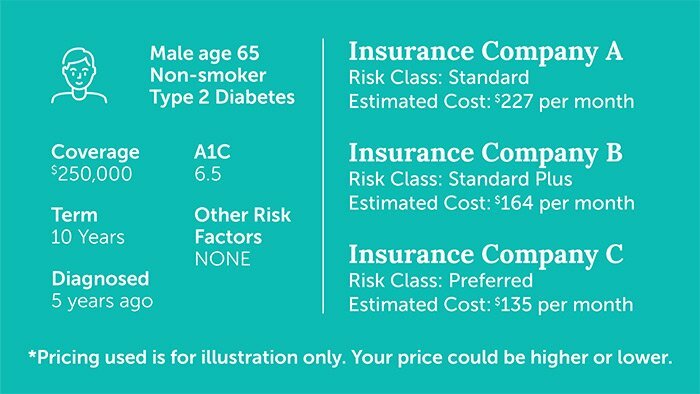 If you are looking to get an idea on the cost of life insurance if you have diabetes, we will need the following information to provide you with an accurate quote. Date of when you were first diagnosed. Your most recent blood sugar reading and whether you monitor it yourself. Most recent glycohemoglobin (HbA1c) or fructosamine level, if available. Hey everyone, we’re Jeanna and Natasha from Quotacy, an online life insurance agency where you can get life insurance on your terms. At Quotacy, our goal is simple: to make it easy for everyone to buy the right amount of life insurance to protect their loved ones. Today, we’re talking about diabetes and the impact it has on the life insurance buying process. The good news is, just because you have type 1 or type 2 diabetes, doesn’t mean you’ll automatically be declined for life insurance. When it comes to diabetes, there are a few key things, such as your A1C levels and how well it’s managed, that will dictate how the life insurance companies evaluate your application to determine the price you’ll pay. However, if you have diabetes, you will pay more for coverage than the average healthy person that does not have diabetes. 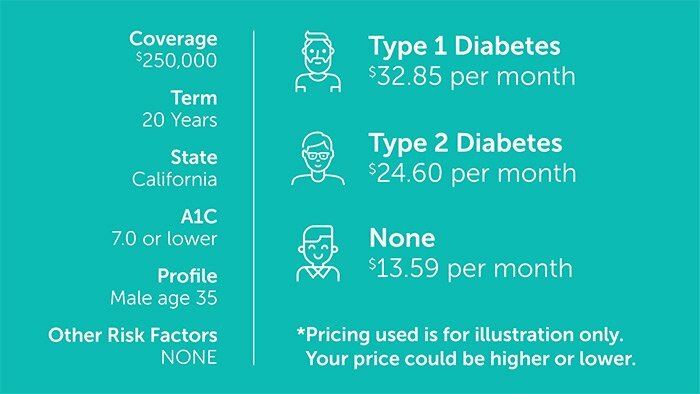 For example, this graphic shows how diabetes affects the cost of a 20-year $250,000 term life insurance policy. These quotes are for three 35-year-old males who are otherwise completely healthy except the man on top has type 1 diabetes, the man in the middle has type 2, and the man on the bottom has neither. To make sure you’re getting the best possible price, work with an independent broker like Quotacy because brokers are not tied to one insurance company. They can shop the market to find a policy that fits your needs and budget. Not all life insurance companies evaluate health conditions in the same way. For example, for diabetes specifically, the way companies view A1C levels can vary. Let’s look at another illustration. Here is a 65-year-old male. He does not smoke and is otherwise healthy except he was diagnosed with type 2 diabetes five years ago. His A1C level is 6.5. He’s applying for a 10-year term policy with $250,000 of coverage. Insurance Company A offers him Standard, putting his price around $227 per month. Insurance Company B offers him Standard Plus, putting his price around $164 per month. Insurance Company C offers him Preferred, putting his price at $135 per month. This is why working with Quotacy can help you. Your agent will anonymously shop the details of your case with all the top-rated life insurance companies we work with to match you with the company who will give you the best offer. Once you choose a policy and complete your online application, first your dedicated Quotacy agent will introduce themselves, and if needed, ask a few follow-up questions about your diabetes via email. This is to make sure we have a clear understanding of your unique situation so we can set realistic expectations upfront. It’s important to mention that we are on your side, so the more we know, the better we can assist you. From there, your agent will send any and all details you’ve provided to our research team that has over 30 years of experience reviewing and underwriting life insurance applications. If our research team feels that a different insurance company other than the one you chose online is going to give you a better price, your agent will present some options to you. The choice to either stay with your original pick or switch is 100% up to you. We just want to be completely transparent about your options. Whatever decision you decide, your agent will be your advocate and keep you updated every step of the way through the process. It’s important to note that if you have diabetes, online life insurance quoting tools alone can’t give you 100% accurate information. There are just too many variables for a computer to calculate. If there is a company out there showing you a cheaper price than what your Quotacy agent can find, that other company is likely only showing you a best-case scenario price and not factoring in your diabetes properly. There are no coupons or promo codes when it comes to life insurance. It’s all very tightly regulated. To find out how much life insurance would cost you, run a quote and apply right online. It takes less than five minutes and there is no obligation to buy. If you aren’t satisfied with the life insurance policy Quotacy finds you, you can walk away. There is no cost to apply for life insurance. No fee to cancel the process. And no hard feelings. At Quotacy you can anonymously run term life insurance quotes on yourself, but how do you choose the right policy? In this blog post we explain how we find you the best policy with the right carrier. Typically one buys life insurance on themselves, but you can also buy life insurance on a loved one or another key person. Learn what the restrictions are and what life insurance companies look for when underwriting a policy. Working with Quotacy was fast, easy, transparent and a great value. I would highly recommend it. Diabetes is more of an inconvenience than anything. It’s annoying and I wish it would go away but the type I have (type 1) is permanent and cannot be treated by diet and exercise. Even though it’s an inconvenience it doesn’t really stop me from doing anything I just have to check my blood sugar and press a few buttons on my pump and I’m on my way but still I really wish I could sit down with a tub of icing and eat it all in one sitting or dance for three hours straight without stopping to check my blood sugar. If you suffer from Diabetes insurers will want to know exactly how you control your condition, and you will probably be asked to undergo a medical before you will be offered cover. You will also need to provide comprehensive details of any treatment through your GP or specialist consultant. Although insurers will be prepared to offer cover to diabetics, not all of them will, as some consider the risks of a claim to be too great. However, your chances of being accepted for cover will be higher if there is plenty of evidence that your condition is being well managed. This will usually involve sending insurers your medical reports and they may even request blood sugar readings. If they aren’t happy that you’ve sent enough evidence, they may reject your application for life insurance. Once you’ve had an application refused, you’re likely to find it much harder to get a policy elsewhere, as you will have to declare you’ve already been turned down for cover, so make sure you choose which insurer you’re going to apply to very carefully.